Those three words define Mary Ann Esposito and the signature cooking style that has made her one of America's most loved television chefs. As the creator and host of the nationally televised PBS series, Ciao Italia with Mary Ann Esposito™, Mary Ann has brought those values to millions of Americans. This year, the series celebrates its milestone 21st season, making it the longest running cooking series in television history. For Mary Ann, the art of Italian cooking is a way of life. As a little girl growing up in Depew, New York, she watched her two Italian grandmothers create wonderful Italian dishes. Both nonnas, one Sicilian and one Neapolitan, were Italian natives and professional cooks. This upbringing instilled in Mary Ann a deep appreciation for Italian food and culture. But it was a pivotal trip to Italy that made her ponder hosting a television program to share her love. Thus, Ciao Italia was born. Through Ciao Italia and appearances on other television programs like The Today Show, Regis and Kelly, QVC, the Food Network, Discovery Channel, and FOX (…not to mention Martha Stewart Radio, RAI International, The Victory Garden, Simply Ming, and so many others! 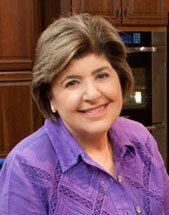 ), she has been able to share the cooking lessons she learned as a child with audiences around the world. Countless organizations have recognized Mary Ann for her efforts to preserve the traditions surrounding Italian food and culture. Johnson and Wales University presented Mary Ann with their Distinguished Author Award. St. Anselm College bestowed an honorary doctorate for her dedication to teaching and preserving authentic Italian cuisine. Most recently, the Italian Trade Commission further distinguished Mary Ann by naming her a 2010 Hall of Fame honoree. The Order Sons of Italy in America (OSIA) honored Mary Ann with the 2009 Lifetime Achievement in the Culinary & Cultural Arts of Italy award. To promote the rich history and customs of Italian Americans, Mary Ann is involved with both OSIA and the National Italian American Foundation (NIAF). As a NIAF member, Mary Ann has appeared as a spokesperson for the foundation’s public service announcements. She has filmed other NIAF members as guests on her show, including the late NIAF Chairman Dr. A. Kenneth Ciongoli. Mary Ann’s participation in OSIA and NIAF are part of Mary Ann’s inspiration to create the Mary Ann Esposito Foundation. The goal of the Foundation is to continue the tradition of Italian cooking in the United States by providing scholarships to the next generation of authentic Italian chefs in the United States. Mary Ann has also written 11 cookbooks. In addition, she hosts an annual trip to Italy. This year, travelers discovered the extraordinary cooking of Tuscany with Mary Ann as they traveled with her and experienced hands-on cooking lessons in which she helped them prepare her favorite Tuscan recipes. Connect with Mary Ann Esposito online through her Facebook page!